Home / Ad Rates / Sample Reviews / Article / CDs, etc. / Links / E-mail BSN / Jukebox Fever Comp!! Click here to order 6 Back Issues in Europe and pay now; through Paypal! Click here to order 10 Back Issues and pay now; through Paypal! Click here to order 15 Back Issues and pay now; through Paypal! Click here to order 20 Back Issues and pay now; through Paypal! Click here to order 25 Back Issues and pay now; through Paypal! BSN Vol.1 #1 thru # 15 - 16 pages; BSN #16 thru #26 - 32-44 pages; BSN #27 thru #31 - 52 pages; #32 to #55 - 68 pages; #56 is 60 pages; #57 to current issue 52 pages. Starting with issue #57 each issue has color covers, and 8 pages that feature color photo layouts, 4 color ads, and other color illustrations. Most artists/events with feature articles listed, cover artist/story in bold - See list below!!! Now is a great time to order complete back issue sets! We're going to discontinue making reprints once the next 68 page issue (#52, about 20 copies left, #37, about 30 copies left) goes out of print, and at that time will provide a CDR with pdf versions of all out of print issues instead. Pictured Below: Issue #73, our 20th Anniversary issue! Order our Latest Issue in PDF form (or any issue #57 - 116) by e-mail, only $5 anywhere in the world! Issues #1, 6, 7, 8, 10, 11, 16, 17, 30 & 31 also available. Digital subscription is $18 for 4 issues, and if you'd like to order any 4 of these listed you can get them as a subscription. Issues #4o - 56 are available for $7.50 each in pdf form. $28 for 4 of them, e-mail us for a Paypal invoice. #45, #48 and #54 are out of print and only available otherwise in photocopy versions with complete back issue sets. Link for digital subscripin can be found at our home page. Click on the highlighted number below to see the cover!!! #16 - Buddy Holly, Bo Diddley, N.Petty, N.Felts, Charlie Feathers 32 p.
#37 - Lady Bo (Diddley), Johnny Carroll, Hillbilly Rocker Eddie Jackson, Rock'n'Roll movies. #45 - The Ventures, Gene Summers, Rudy Tutti Grayzell, Wayne Hancock, Jimmie Vaughan, Groovey Joe Poovey, Blues Awards, San Francisco Greaseball'98, Russell Scott & The Red Hots Reprint only $15.00! #52 - James Intveld, Sonny Burgess & The Pacers Part 2, Grady Champman with the Robins & Coasters, Kid Ramos, Experience Music Project Grand Opening, Larry Hall & "Sandy"
#59 - Ray Campi, Cave Catt Sammy, John Hammond, Viva Las Vegas 5, Bob Kelly, Hemsby 28, Jazzfest & more! #60 - Collins Kids, Green Bay Rockin' 50s Week, Patsy Montana, Billy Adams, Starline Rhythm Boys & More! #61 - Ronnie Hawkins, Dave Alvin/Blasters, Billy Lee Riley, Tom Armstrong, Evan Johns, Russian Rockabilly & More! #62 - Deke Dickerson, Bill Kirchen, Ray Campi, Ted Roddy, Tony Spezio, & More!! #63 - Nick Curran, Frank "Andy" Starr, Ponderosa Stomp, Linda Gail Lewis, Huelyn Duvall, Johnny Legend, Noble "Thin Man" Watts & More! #64 - Wanda Jackson, Big Al Downing, Al Urban, Rockin' Seattle Scene, Our Germany Holland Tour - saw Eva Eastwood play! & More! #65 - Johnny Cash, Ronnie Dawson, Cornell Hurd Band, Marti Brom, Arkie Shibley, Frank "Andy" Starr, Rockabilly Ball, Legends of country show & More! #67 - Mack Stevens, Viva Las Vegas 7, Rosie Flores, Ray Condo, Danny Cedrone & "Rock Around The Clock",& More! #68 - Ray Charles, Jerry Sikorsky, Don Maddox, Charlie "Hot Rod Lincoln" Ryan, Billy Swan, Don Rader, & More! #69 - Lew Williams, Dale Watson, Tommy Steele, Matt Lucas & James Burton recording, Bumbershoot, Rockabilly Ball, Seattle area Rockin' & More! #70 ­ Candye Kane, Lew Williams, Laura Lee Perkins, Jerry Sikorski, Colin Winski & More! #72 ­ Rod Piazza , Floyd Tillman, Lou Whitney & The Morells, Little Rachel, Screamin'Fest, The Secrets, & More!!! 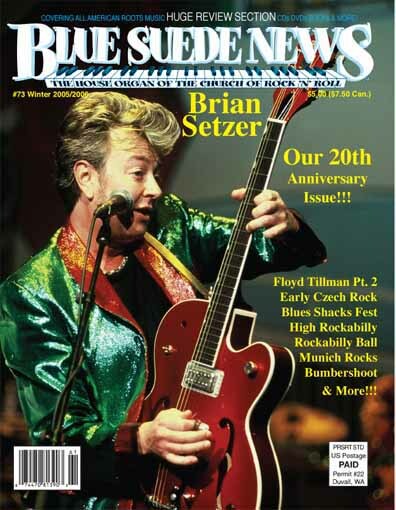 #73 ­ Brian Setzer - , Floyd Tillman Pt. 2, Early Czech Rock, Blues Shacks Fest, High Rockabilly, Rockabilly Ball, Munich Rocks, Bumbershoot & More! #74 - Lee Rocker - Wanda Jackson, Billy Strange, The Surfaris, The Blasters, Sid King & The Five Strings, & More!! #75 - Buck Owens - Lee Rocker, Pt. 2, Angela Strehli, Ponderosa Stomp 2006, Viva Las Vegas, & More!! #76 - Janiva Magness - Big Sandy, Linda Gail Lewis, Ronnie Dove, Hootenannay, Ruby Ann & More!! #91 - Jimmy Vaughan, Lowell Fulson, Blues Music Awards, Great Women Singers of the '50s & '60s, Karling Abbeygate, Rayburn Anthony, Tejano Fan fair. #92 - Duane Eddy, Lowell Fulson part 2, Lynda Kay Parker, Bernadette Carroll, Cahors Blues Fest, Rockabilly Ball, Annita & More! #93 - Jack Scott, Jason D. Williams, Clyde Stacy, Barbara Mills, the Five Checks, Red Robinson, Rockabilly Ball & More! #94 - Ferlin Husky, Bakersfield Sound, The Highlighters, Phil Spector, Vintage Torque, Rockabilly Ball, Dr. Bruce Nelson & More! #95 - JD McPherson, Jackie DeShannon, Billy Burnette, the Murmaids, the Gallahads, Viva Las Vegas 14, Excello Records Reunion & More! #96 - Dale Watson, Joe Stampley, the Frantics, Ponderosa Stomp #10, Rockin' E Jamboree, Heartbreak Hotel & More! #97 - Chris Isaak, Ron Holden & The Playboys, Edward Union & The Volumes, the Five Emprees, the Aardvarks, the Mussies, Poor Boys Pride & More! #98 - Janis Martin, Duane Eddy, Chris Smither, Robin Luke, PA Blues Fest, Kitty Wells, Betty Logan, Babe Zaharias, Bette Anne Steele & More! #99 - Rosie Flores, Sixto Rodriguez, Harry Peterson, Gale Garnett, the Lucky Tubb, the Rockabilly Ball, Voice of the Wetlands Festival & More! to the address given above. Office hours: Noon - 8pm, but call anytime, we'll get back to you!